It is a short distance to Halfpenny Bridge which could be considered the first “proper” bridge of the river in that it has sufficient headroom to allow river-craft to pass freely underneath. There are 106 more bridges that cross the navigable river between Lechlade and the Flood Barrier. Halfpenny Bridge was constructed in 1792 by James Hollingsworth, and the clearance of 4.72M (15ft 6in) was high enough at that time to avoid the need to lower the masts of the vessels passing beneath. It does not stretch the imagination much to discover that the bridge originally took its name from the toll originally levied for crossing it. It was not a popular toll (are they ever?) and the locals were having none of it. Resentment increased every year and in 1839 they rebelled and all banded together and refused to pay the toll. This inevitably led to some lively altercations with the toll collectors, and people tended to cross the bridge in groups in a show of strength to make it easier for them to resist the demands of the toll gatherers. All efforts at extracting tolls were finally abandoned in 1875 and the bridge has been toll-free ever since. Perhaps some of the descendants of those early liberators would like to accompany me down to London and campaign to get rid of Cuddly Ken’s much hated London congestion charge. (NB In a few days time and before I reach the capital, Cuddly Ken was displaced by Bouncing Boris, but the detested congestion “toll” still remained in place). Lechlade is mentioned in the Doomsday Book, and has been a major borough since the early 12th century. The town signs announce that Lechlade is an inland port, and this was the foundation of its wealth. Although the town was a major force for the English wool trade, Lechlade’s primary function was as a staging post for freight to London. Cotswold wool and the finest Gloucestershire cheeses were the main goods that were brought to the wharves of Lechlade for transfer to the river barges that would take them to the commercial market places of London. The opening of the Severn and Thames Canal increased the volume of trade immensely and the town grew very wealthy as a consequence. The landmark church dates from 1476 and is considered to be one of the finest in Gloucestershire. It is believed that it was dedicated to St Lawrence at the wish of Catherine of Aragon whose pomegranate symbol can be seen on the vestry door. 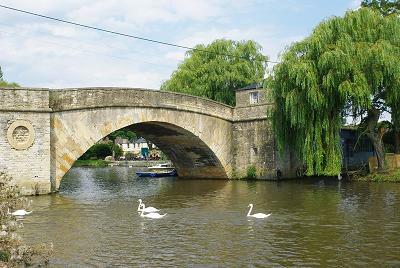 The poet Percy Bysshe Shelley visited Lechlade in September 1815. Standing in the churchyard with Mary his wife, and friends Charles Claremont and Thomas Love Peacock he watched the sun setting and was inspired to write his poem “Summer Evening Churchyard, Lechlade”. Creep hand in hand from yon obscurest glen. Responding to the charm with its own mystery. Knows not their gentle motions as they pass. Gather among the stars the clouds of night. Its awful hush is felt inaudibly. And terrorless as this serenest night. That loveliest dreams perpetual watch did keep.